Public interest in the presidential campaign is about as high as it was four years ago, despite the fact that only one party currently has a competitive nomination contest. 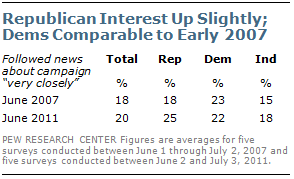 And while the focus this year has been on the GOP’s race, Democrats express about as much interest in 2012 candidates as do Republicans. Overall, 21% of the public say they followed news about the potential presidential candidates very closely last week, according to the latest weekly News Interest Index survey conducted June 30- July 3 among 1,001 adults by the Pew Research Center for the People & the Press. Interest has been at about this level for the past several months. At a comparable point in the presidential race four years ago, 20% said they were very closely following news about the candidates hoping to represent their parties in the 2008 election. As is the case today, the level of interest fluctuated only slightly week to week in 2007. Earlier this year, a series of major breaking stories — such as the Gabrielle Giffords’ shooting, the upheaval in the Middle East, the disasters in Japan and the killing of Osama bin Laden — dominated the news and the public’s interest. At this early stage in the campaign, relatively small numbers say they are following election news more closely than other major stories. For example, 9% say they followed news about the candidates most closely last week, while 22% say news about the condition of the U.S. economy was their top story and 13% cite the debate in Washington over the federal deficit and the national debt. Over the past month, interest among Republicans in the presidential candidates has been higher than it was in June 2007: Since the beginning of June, an average of 25% of Republicans have been tracking news about the candidates very closely each week, compared with an average of 18% during the same period four years ago. Despite the focus on GOP candidates this year, Democrats are expressing about the same level of interest in the presidential candidates as they did during June 2007. Over the past five weeks, 22% of Democrats, on average, have been following news about the candidates very closely, which is virtually identical to interest four years ago (23%). Among independents, an average of 18% over this time period say they have followed news about the candidates very closely; 15% said this for the same span in 2007. In the new survey, Republicans and Republican-leaning independents who agree with the Tea Party express far more interest in the presidential candidates than do other Republicans. Nearly four-in-ten (37%) Republicans and Republican leaners who agree with the Tea Party say they are tracking news about the candidates very closely, compared with just 19% of Republicans and Republican leaners who have no opinion of the Tea Party or disagree with the movement. 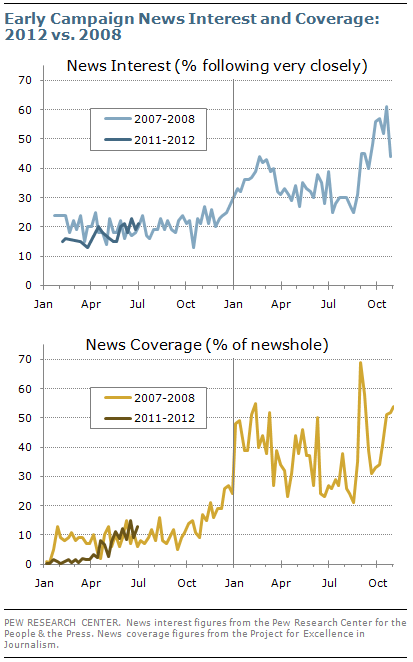 A plurality of Americans (41%) say news organizations are giving the right amount of coverage to possible candidates for the 2012 elections, while 29% say they are giving too much coverage to election news. That is up slightly from 22% in April. Another 16% say the press is giving too little coverage to the candidates. Pluralities also say news organizations are giving the right amount of coverage to the situation in Afghanistan (42%) and news about the federal budget deficit and national debt (44%). Republicans are more satisfied with the amount of campaign news coverage than they were in April. Currently, 54% of Republicans say possible presidential candidates are receiving the right amount of coverage, while just 17% say they are getting too little coverage. In April, 40% said the candidates were getting the right amount of coverage, while nearly as many (34%) said they were being under-covered. 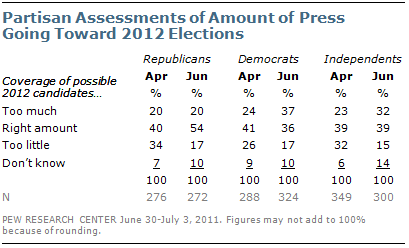 By contrast, more Democrats and independents say the 2012 candidates are drawing too much coverage. Currently, 37% of Democrats and 32% of independents say the possible presidential candidates are receiving too much coverage, up from 24% and 23%, respectively, in April. News about the economy’s continued troubles topped the public’s news interest last week with 22% saying this was the news they followed most closely. Nearly four-in-ten (38%) say they followed news about the economic situation very closely, a level essentially unchanged in recent weeks. 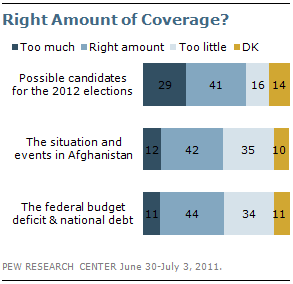 According to PEJ, coverage focused on both economic concerns and the 2012 elections. 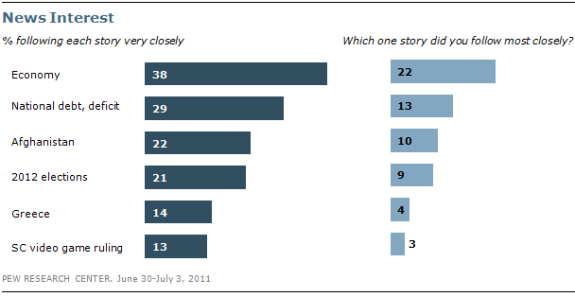 While the elections accounted for 13% of coverage, economic story lines accounted for a total of 19%. The bulk of coverage focused on the debt limit discussions underway in Washington (12%), while more general economic news accounted for 7%. More than one-in-ten (13%) say they followed the discussions in Washington over whether to raise the debt limit more closely than any other major story. About three-in-ten (29%) say they followed these developments very closely. In mid-June, 24% said they were following the debate over whether to raise the federal debt limit very closely. One-in-ten (10%) say news about the situation in Afghanistan was their top story; 22% say they followed news about Afghanistan very closely. This news accounted for 5% of coverage. Smaller numbers cite the financial crisis and protests in Greece (4%) or the Supreme Court ruling that overturned a California ban on selling violent videogames to minors (3%) as their top story. Just 14% say they followed news about the Greek protests very closely, while 13% say they followed news about the court ruling this closely. Two weeks ago, the same number said they were following the court’s decision dismissing a class action lawsuit against Wal-Mart very closely. 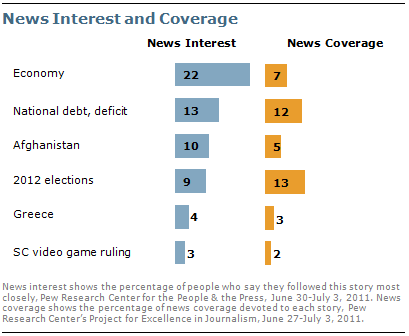 The protests in Greece made up 3% of coverage, while the Supreme Court ruling accounted for 2%. These findings are based on the most recent installment of the weekly News Interest Index, an ongoing project of the Pew Research Center for the People & the Press. The index, building on the Center’s longstanding research into public attentiveness to major news stories, examines news interest as it relates to the news media’s coverage. The weekly survey is conducted in conjunction with The Project for Excellence in Journalism’s News Coverage Index, which monitors the news reported by major newspaper, television, radio and online news outlets on an ongoing basis. In the most recent week, data relating to news coverage were collected June 27-July 3, and survey data measuring public interest in the top news stories of the week were collected June 30-July 3 from a nationally representative sample of 1,001 adults.